Do you know what the best part about being in this Yummy Mummy Food Company business is? 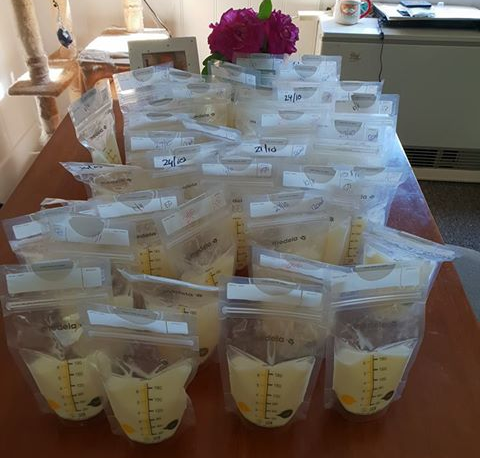 It's hearing and seeing some of the amazing results from mums like Samantha who recently sent this photo in of ALL the breastmilk she's been able to express and freeze since regularly eating our Feeding Cookies! "6.5 litres in 6 weeks of having your amazing cookies. I'm now freezing off every 3 days. I'm stocking up for when I return to work and never thought in a million years I could be able to produce that!" Source: National Health and Medical Research Council 2012,Infant Feeding Guidelines. NHMRC, Canberra p59. Don't forget to always label the bottles or bags with the amount and the date it was pumped, so you can track and manage your stored milk. Stored breast milk does tend to separate into layers, with the fat (cream) rising to the top. When you make up a bottle, swirl the bottle gently to mix the layers before feeding your baby, but don't shake or stir it vigorously as this can potentially cause damage some of the milk’s nutritional and protective components. When you feed your babyexpressed milk from a cup or bottle, bacteria from their mouth can naturally end up in the milk. So, it is important to throw away any leftover, partly drunk milk within one to two hours of this feed. To avoid wasting your precious liquid gold, it’s always a good idea to store it in smaller amounts, and then you're only using what you need. Hope this helps explain simply and easily!